Album review! 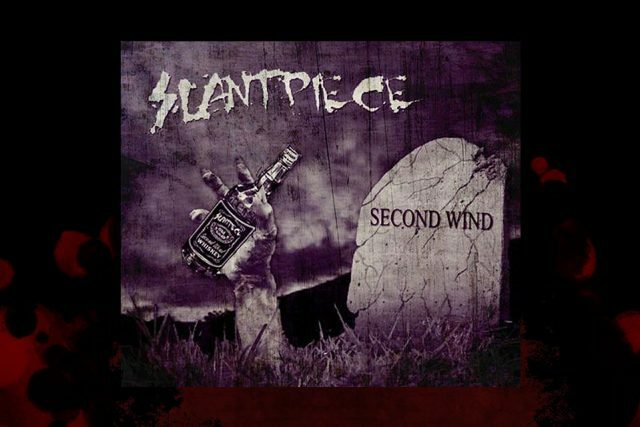 Slantpiece's new record titled "Second Wind". | Badass Concert | Heavy Metal Music News | So METAL, we piss RUST! Home News Album review! Slantpiece’s new record titled “Second Wind”. I’ve been keeping a secret from you guys. Not only is it juicy, but it’s heavy, hooky, and tight. No, it’s not Melinda the overweight prostitute…it’s the new record from Slantpiece, Second Wind!! Slantpiece plays heavy metal party music. If you’ve had the distinct pleasure of catching them live, you know what I mean. Their first release, Get You Some, is a shotgun blast to the kill zone, but Second Wind is a sniper shot to the heart. Each song is well-written, and you might not even make it through one song, the first time, without singing along. I didn’t think it was possible, but Slantpiece sounds even tighter than they have before. I credit some of this to the growing relationship between the band and producer Michael Beck. Read our recent interview with Beck here. This record sounds every bit as good as anything you’ll get from a major label act. Not only is Beck an expert knob-twister, but he pulls the best performances out of Slantpiece, especially vocalist Derek Johnson. Johnson expands his vocal dynamic on Second Wind with more brutal screaming mixed in with his gruff, yet melodic, singing parts. Johnson’s expansion in vocal range is matched by the whole band’s dynamic. There are still plenty of the signature Slantpiece “run-dit-dun-dun-dit-it-dun-dun”s all over this record, but they stretch out in every direction. The band jumps right out of the driving heaviness of the opening track, into the swampy grooves of the album’s first single, “Baptized in Whiskey.” I see why the band picked this song for radio play, as it is the catchiest song on the record, but not by much; every track on this release is an ear worm, in one way or another. But when the song shifts gears from the minimalist verse to the huge chorus, it’s like a goddamn bomb going off. What a cool effect, accomplished by expert arrangement and production. Then Slantpiece switches it up again with a heavy single-note riff that propels the third track, “Shallow Grave.” This song really showcases how heavy Derek Johnson’s voice can get. I don’t know for sure, but I think the awesome Gollum-esque high screams on the chorus are from bassist Wryan “Carpy” Carpenter. There is also some slick lead guitar work from the other Derek, Tavis, with a single note line that serves as an additional hook during the chorus, and a well-executed solo that concludes with some other-worldly controlled noise. The first time I heard Second Wind, “Stuck in a Rut” really stood out as an outlier. Its snare drum/clean guitar opening and the chord groove that serves as the harmonic base of the song piqued my curiosity. It is an ultra-tasty song, but it took me a few listens to figure out where it fits in the Slantpiece universe. But its southern-rock influenced verses and scream-along chorus make it another great party song for the Slantpiece set list. I really enjoy how this track takes the dynamic of the record to uncharted places. “Scars” is another hard-hitting track, with a slinky, bouncy riff, and a neck-snapping breakdown. “Stuck in a Rut” might be the least heavy track on the record, but they follow it up with “Scars,” one of the heaviest. The title track of this six-song record comes last. “Second Wind” mashes up all the great things about Slantpiece. From the sludgy verses, to the Pantera-tinged chorus, to the punky bridge, this is a great way to wrap up the record. It leaves you wanting. As I wrote this review, I AB’d Second Wind and Get You Some. It is absolutely astonishing how much better the audio quality is on the new record. Get You Some is great, don’t get me wrong, but Second Wind really takes it to the next level for Slantpiece. The sound, coupled with the awesome songs and their wide range, truly makes this a gem for our Midwestern metal scene. There are no definite plans at this time for a release, but as soon as we know, we’ll let you know! Keep checking in on BadassConcert.com. If you don’t already, follow us on Facebook and Twitter!!! P.S. Derek Johnson asked me what my favorite track on the record was, and DJ, here’s your answer… “Stuck in a Rut.” It’s the one I keep coming back to!! !